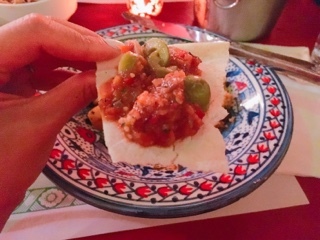 There’s something seductive about Moroccan food… maybe because my first experience was at a popular tourist destination in Toronto where the so-so food is accompanied by belly dancers. 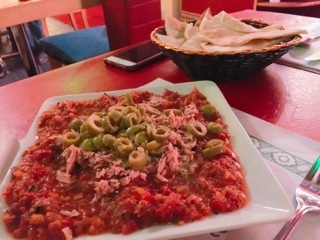 Even without the entertainment, walking into the cozy Menthe et Couscous and settling onto their jewel toned bench, I knew I was in for a treat. 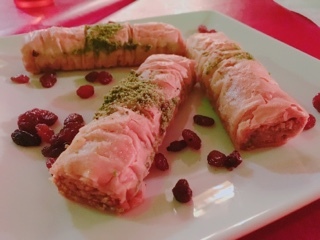 Moroccan cuisine is known for incorporating a variety of spices aiming to meld with the food rather than overpower. Of course there’s a ton of flavours, but nothing’s so spicy you need milk, sour that your eyes water, etc. Rather it’s the spices combined with freshness of herbs that makes it so tantalizing. Just walk into the dining room and the scents will coyly play with your nose. Normally, anything with ‘salad’ in the title is a quick dismiss, but the description of the Tunisia mechouia salad ($9.25) was so intriguing that I had to try it. First off, the dish is hearty and nothing like the leafy green variety. A medley of grilled vegetable is crushed into a thick paste - when spread onto a pita the topping resembles a less tangy bruschetta. 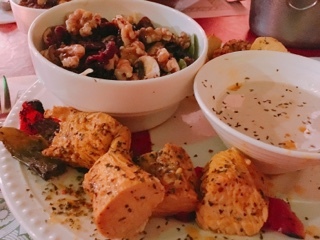 I was a bit taken aback with the flaked tuna and olives topping the dish, yet the meaty tuna, peppery grilled vegetables, and briny olives actually were delicious together. The pita was rather hard, but also holds up against the saucy mixture so you can consume the starter rather cleanly. For the less adventurous, the chicken brochettes ($19.50) are a safe choice. Essentially grilled chicken skewers, at Menthe et Couscous they’re not overly charred and rather juicy for white meat. The nutty tahini and house salad combining mushrooms, cranberries, walnuts, and a pomegranate dressing makes it different, but hardly wildly seductive. 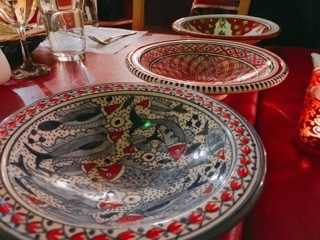 What will get your mouth moaning is the tajine. Unfortunately, the dome covering it was taken away before I could snap a picture, but it’s essentially a cone shaped lid that helps braise and steam the contents – as the steam rises it’s captures in the vessel and drips back down into the base so the flavours aren’t lost. 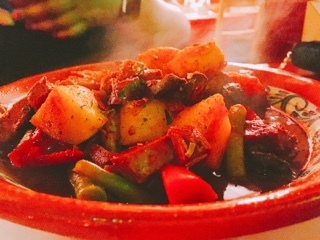 The resulting lamb tajine ($23.95) is similar to stew but a whole lot more flavourful and since it uses less (if any) broth, the meat and vegetables’ natural flavours shine through. Additionally, the vegetables still have a bite to them so aren’t mushy like stew. 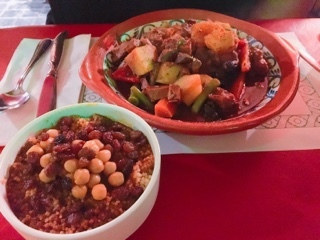 Served with a large bowl of moist couscous topped with softened chick peas and cranberries, the grains are great for spooning the tajine’s juices onto … the gravy like sauce so good I would happily just have a bowl of couscous and plain sauce. 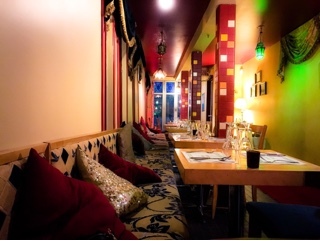 Menthe et Couscous’ warm dimly lit dining room makes you want to sit and relax after dinner. 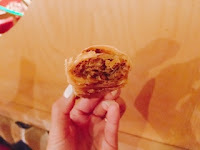 Wanting the experience to last longer, we caved in for the baklava ($3.95 each). I wasn’t particularly looking forward to the ultra-sweet dessert, but Menthe’s is dry enough to hold and uses just enough honey for sweetness. The baklava was a great ending without the heavy oiliness that normally follows the dessert. 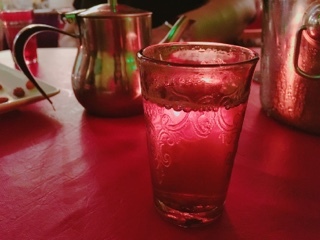 Their green tea with mint ($2.95) is also perfect for easing the stomach after a filling meal – after all the indulgences the aromatic slightly bitter tea is refreshing and soothing. The restaurant certainly doesn’t skimp on the herb (there’s an entire sprig in the teapot) and serves the tea traditionally by pouring it highly so bubbles temporarily form and burst to release an intoxicating aroma. Even without the discount being offered, a meal at Menthe et Couscous is affordable. The mains are pretty sizeable, so the two mains with a salad were more than enough to satisfy. Additionally, they have a bring your own wine program with no corkage fees, so you don’t mind opening another one… so you stay just a bit longer … oh seduction. Disclaimer: The above meal was offered at a discounted price. Rest assured, as noted in my mission statement, I will always provide an honest opinion.